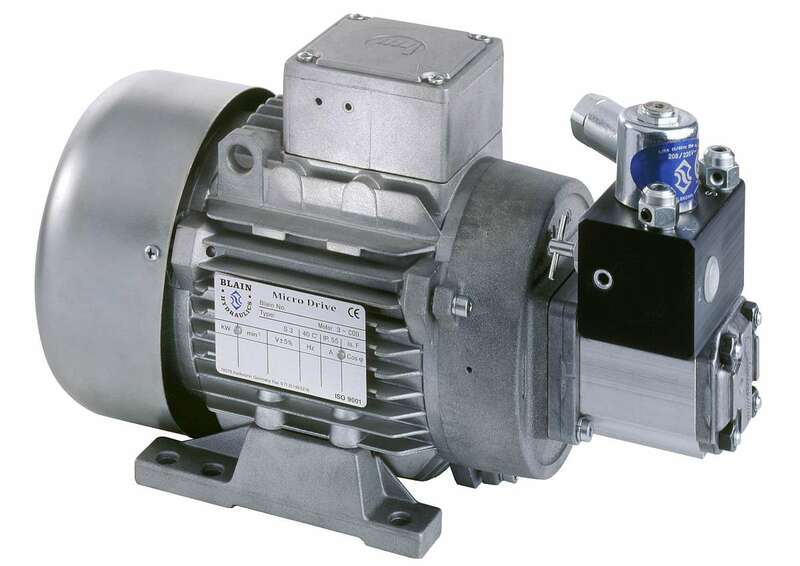 The Blain Micro Drive for hydraulic elevators consists of a small motor, pump and valve unit in one assembly. Exact floor stops and re-levelling operations are achieved with low electrical power requirement, low noise levels and no unnecessary heating of the oil. The MD unit is mounted on or under the cover of the main hydraulic power unit, using the same oil source. It can also be used to slowly move the car independently of the main drive during installation or in an emergency. The Micro Drive is equally effective as a separate unit for accurate releveling of traction elevators, where a small cylinder is integrated into the cable suspension. This eliminates the need to start the main drive when the car needs to be moved only a few centimeters. Micro leveling at approximately 1 cm/sec (2 ft./min.) is recommended at which speed positioning of the car is highly accurate and the releveling movement, usually lasting less than a second, is barely if at all noticeable by the passenger. Floor stopping accuracy of better than plus-minus 5 mm (0.2 inch) can be expected, provided the floor switch system is correspondingly accurate. Outside of 2 cm (0.8 inch) from the floor landing, the main elevator releveling system must be activated. Increased safety Exact landing of the car eliminates the danger of passengers tripping while entering or leaving the car. Because the Micro Drive assures final stopping accuracy, the main leveling approach speed to the floor can be increased to approximately 10 cm/sec (20 ft/min) to shorten traveling time. When a load is added to or removed from the car causing it to shift its position, the MD Unit releveling correction begins instantaneously and usually taking less than one second to complete. There is no unwanted delay due to bypassing of oil as it is the case with the main hydraulic drive. Since the main power unit does not need to be started; releveling with the Micro Drive unit is quiet and shorter in duration than when employing the main hydraulic drive. This is especially important in private homes or offices, where the releveling sound of the main elevator drive can be disturbing; especially at nighttime.